Description: Our folder printing service gives you A5+ 5mm capacity folders printed in full colour on one side with glued pocket. Our folders are designed to hold A5 size paper. Our single sided 5mm capacity folders are printed in full colour on one side on eco-friendly paper from sustainable sources and are designed to hold A5 size paper. 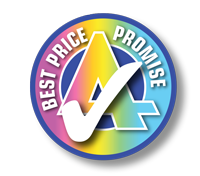 Our prices include FREE delivery within 10 working days to one UK address excluding Highland and Islands and there is no charge for debit or credit cards. For deliveries to Highland and Islands please call for a price that includes delivery to these locations. 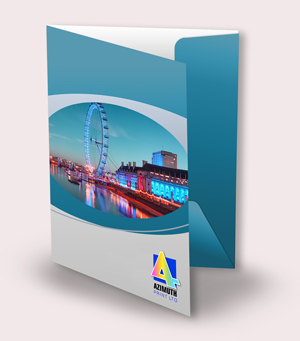 If you need your folder printing sooner, contact us to discuss a quicker delivery time. Other quantities and paper weights also available on request. To mark the occasion of our new installation we are pleased to announce that we are offering FREE matt or gloss lamination in June on all folder orders placed with us.